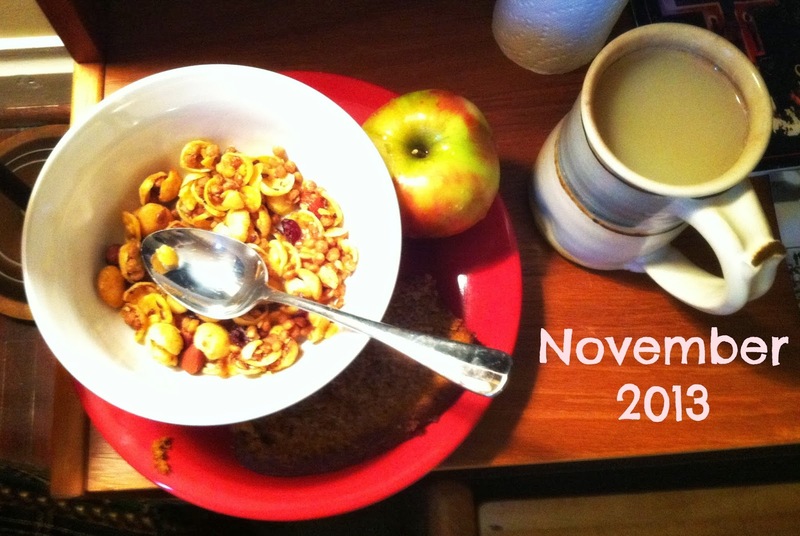 Ordinary Goodness: What I Loved in November. What I Loved in November. Anne Lamott: My friend Erin and I had a lovely brunch after church, and then snagged seats in the front row to hear Lamott speak and read from her new book, Stitches. It was a great crowd and really enjoyable to hear her in person. One of her many insights that stuck with me: "We compare our insides to other people's outsides." Grad school news: I found out that I got accepted to Goddard College's MFA program in creative writing! I'll begin the low-residency program in January, and am so excited to see what awaits. Basketball season: Ah, college basketball, the most wonderful time of the year. It's always refreshing and meaningful to get back to cheering for my Davidson Wildcats with our great community. New recipes: I finished Bread and Wine, Shauna Niequist's spiritual cooking memoir (what an epic combination of genres!) and tried several of her recipes. Two of my favorites so far: Breakfast Cookies and Magical White Bean Soup. My friend Ann also posted a recipe on Facebook for this Pumpkin Macaroni and Cheese. Seasonally-appropriate, right? And easy, and delicious. Trader Joe's granola & jasmine green tea with milk: It's pretty simple, but this non-morning person has found mornings much lovelier while munching and sipping on these. The Cuckoo's Calling: I finally read Robert Galbraith's (a.k.a. Jo Rowling's) first mystery novel, and LOVED it. In my opinion, her gift for rich storytelling carries over so well from the wizards of Hogwarts to the fictional lives of rich and famous Muggle Londoners. Sometimes I find it even more amazing that she can create cultural icons from scratch in the real world, after creating an entire world from scratch with Harry Potter. Bottom line: The book is well worth it and I hope she writes many more featuring Detective Cormoran Strike. Also, every time I read "Lula Landry" I couldn't help thinking "Luna Lovegood." Two more different characters you could never find... And yet they came from the same imagination! Thor: The Dark World: We're big fans of Marvel movies around here, and this one had been on our list for awhile. We've seen it twice and loved it. The whole ensemble is wonderful, and I particularly enjoyed the antics of Jane's research cohort - I think Kat Dennings is hilarious. Chris Hemsworth is great, and sometimes reminds me of Heath Ledger in his happier go-lucky days, which is always a good thing. Also, this movie has made me a bona fide Loki fan. Tom Hiddleston has always been good, but his layers, illusions and wry wit in all their glory make him truly excellent. Reunions: I've caught up with friends via phone, Skype and in person this month - hooray! One Saturday in the middle of the month was especially fun, with a bunch of folks coming into town for a basketball game in the heart of downtown (oops, I mean uptown). That afternoon, two good friends and I caught up over delicious crepes. Mom comes to town: I always love it when my mother comes to visit, and this time was no exception. We shopped for a wedding dress - and found one! - and also had lots of time to relax, watch movies, read, go out to eat and enjoy each other's company. Thanksgiving holidays: Where should I start? I was so grateful for a few days of calm and cozy HOME. Crockpot dinners, chocolate chip cookies, tea, sleeping in, Harry Potter movie marathon, fires in the fireplace, my puppy dog, football, get-togethers with friends, favorite restaurants, and Kady gave me my quilt! Not to mention a savory Thanksgiving meal with extended family and lots of laughter. It's strange to think that only 48 hours later, my grandfather was hospitalized after suffering a stroke. We don't know what the next weeks or months will bring, so I am extra thankful for the wonderful time we spent together on Thanksgiving Day. Now it's time for Advent! Congratulations on your acceptance to the MFA program! What an accomplishment. Glad to read your thoughts on both The Cuckoo's Calling and Thor: The Dark World. I haven't read anything non-Potter of Rowling's for fear of disappointment, and I've been waffling over whether to watch the new Thor or not (because I wasn't a fan of the first one). Christie, thanks! Yes, I think both "Cuckoo's Calling" and "Thor: The Dark World" are worth it - both better than "Casual Vacancy" and Thor 1. Hope you enjoy both! Ann - YES. My brother and I grew up on superheroes so I love them! Congratulations on getting into the MFA program! That's exciting. Glad to hear you enjoyed The Cuckoo's Calling, as I did also. I've heard it'll be turned into a series and I definitely can't wait to see what happens with those characters. Sorry to hear about your grandfather's stroke. I hope his recovery is going well.